Rugged construction assures years of superior performance from this maximum-duty truck. Ideal for transporting sheetrock, building materials, office partition panels, furniture, TVs, luggage and other heavy loads. 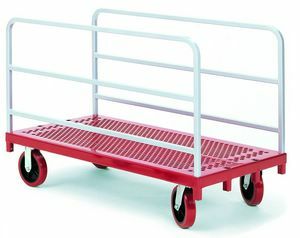 Platform Base: 12-gauge robotic welded steel base reinforced with 12-gauge steel ribs for lasting durability. 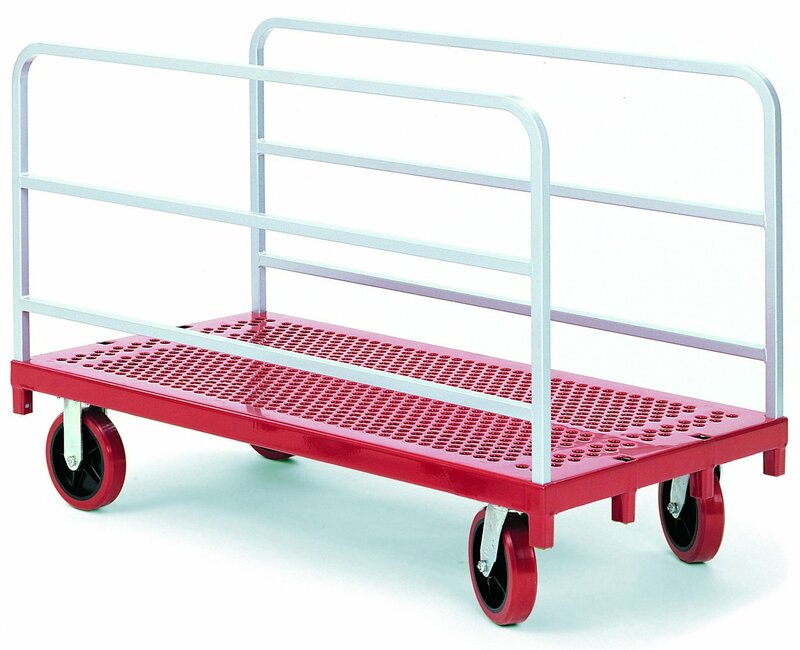 Platform is coated with anti-skid polyvinyl to help secure and protect the load. Push handle or heavy-duty uprights equipped with two cross-braces for maximum strength and to keep small parcels in place. Dimensions: 30" x 54" overall; 11 3/4" floor to top of base; 8 1/2" between upright sockets. Uprights extend 26 1/4" above base. Packed one per carton. Casters: 8" x 2" Quiet Poly, 2 fixed, two swivel optional brake kits available. Removable uprights: 2 Packed: One cartonShipping weight: 142. Must ship by truck. 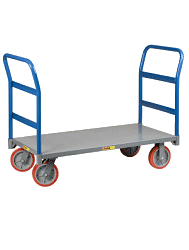 We are committed to providing you with the widest select of quality hand trucks and accessories, at the best prices. We stand behind everything we sell here at Hand Trucks R Us, and promise you the best online shopping experience. We have done everything possible to make purchasing at our site the best option of any existing retailer online or offline. We really pride ourselves on our excellent product knowledge, and fast service. We are committed to making your experience with us enjoyable and one that you will want to share with others. Customer satisfaction is our top priority, and we want you to be completely satisfied with your purchase. If you are not satisfied with your purchase, you can return or exchange the item within 30 days of receipt as long as the item is returned in new, unused and resalable condition inside its original packaging. Items properly returned under this policy are eligible for a refund. We will credit you for the total purchase price less any applicable restocking fees and shipping/handling charges to and from our facility. Includes 2 Paks of cords (4 cords total). New and Improved - Stronger then conventional cords. They will not scratch or mar. Engineered to with stand the elements. Totally adjustable with a simple tug and locks into postion. The most convenient, versatile invention we've seen in years! The 15' x 1" x 300 lbs. Ratchet Tie Down resists weather, rot and mildew. It features a spring-loaded release mechanism for easy usage. This ratchet tie-down comes in a blue color. Keep you and your equipment safe. Combination locking mechanisms for keyless convenience. Flexible steel cables for strong cut resistance. Vinyl coating helps prevent scratching. Cable/ChainLength 48" (4'). Liberator Aluminum Curb Ramp 22" x 24"
Assists the operator with going up and over curbs, raised doorways, and up single steps.